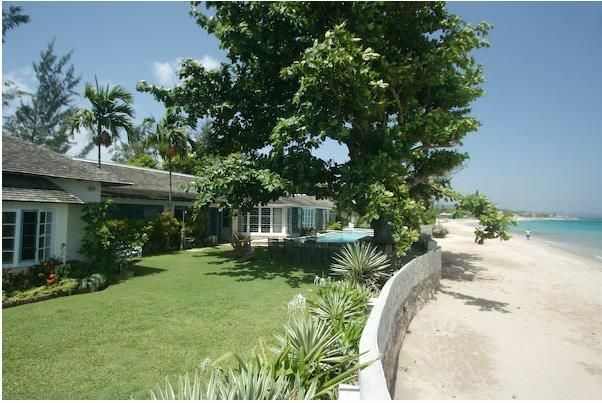 Siesta Villa is a spacious 5+ bedroom beach front retreat in Runaway Bay on Jamaica's idyllic North Coast. This spacious villa has a large living room, dining room and a 60 foot porch gallery all looking out to the pool and the one mile crescent of Runaway Bay Beach. The exterior is focused on the new swimming pool, powdery white sand beach and lovely gardens. Siesta has 5 air-conditioned bedrooms with private baths and can easily accommodate up to 10 adults. The villa is fully staffed with cook, housekeeper, gardener, laundress and night security guard. Siesta's enviable location is within 5 beach walking minutes of Breezes Hotel. The Breezes Championship Golf Course is one minute away by car. The villa comes with 2 ocean kayaks, floats and other beach toys. King sized bed with beach views and full bath. Two double beds and full bath. Two twin beds, that can be made into a king bed if desired, full bath. There is also a small room with a twin bed that is perfect for a small child right off this room. King bed, beach views and full bath. King bed with bath with shower. Bay Watch Villa: 3-5 bedrooms/ 3-5 baths (Bay Watch Annex has two bedrooms and loft; each with double beds). Siesta, Main house has 5 air conditioned bedrooms, 5 baths can accommodate up to 10 adults. Bahia Cottage can accommodate up to 2 adults. Bay Watch Villa and Annex can accommodate up to 10 adults and 2 children. Siesta is a delightful and casual beach home with a wonderful staff.